So do we perish of shame, or rather, as Bernard Lazare suggests in his extraordinary remark, do we die from hiding our shames? Shame swept under the carpet, this history suggests, breeds violence like nothing else. What would it be like to live in a world in which we did not have to be ashamed of shame? I just finished reading Jacqueline Rose’s The Question of Zion, which is one of the hardest books I’ve had to read in awhile. Perhaps it’s because I’ve been immersed in as much readings as I could find on the topic of Israel and Palestine for the review I was writing for Pop Matters on Gilbert Achcar’s The Arabs and the Holocaust, a book I desperately wanted to read but felt underqualified to review, that Rose’s book seemed particularly harder to read and think about than it actually is. Rose’s book requires a mind willing to go deep into dark, murky, subterranean places, and it requires a willingness to temporarily abandon a position – if only to return to it later – to excavate the tangled, labyrinthine histories of the roots of Zionism. Owing its debt to psychoanalysis, Freud, and Lacan, Rose’s book tries to understand an ideology as symptom – Zionism as a form of phantasy, schizophrenia, and refuge. Because Rose is also deeply influenced by Edward Said, her project follows in his tradition of tender yet ruthless interrogation. She refrains from dehumanising the aggressors and perpetrators of violence, and tries instead to bring into focus the roots of their own torment that led them to this place of terror, both feared and inflicted. Understanding Israel’s violence means understanding anti-Semitism and the Holocaust, and the willingness (courage?) to locate the roots of deep violence against the Jewish people that shades much of Europe’s history. Rose doesn’t offer solutions, but a psychoanalytic interrogation of Israel’s violence, I think, hinges upon that quote I’ve referred to above. The shame of the Holocaust, and the burdens of historical marginalisation, are scars that refuse to heal, and continue to inflict their pain through imagined power manifested through brutal oppression of others. Rose refers to the “cruelty that native Israelis had shown to the survivors” of the Holocaust, points to Ben-Gurion’s remarks that “we do not belong to that Jewish people” – that Jewish people being shameful aberrations, people who allowed what seemed to be unimaginable violence to be done to them. In this repudiation of their own history and their own people, Rose seems to say, lies Israel and Zionism’s tragic error – which, for all of us cognisant of the history of Israeli war and occupation, is a tragedy that keeps repeating itself on the Palestinians. No violence is unimaginable, of course. Once imagined, it keeps repeating itself through the shame it inflicts. 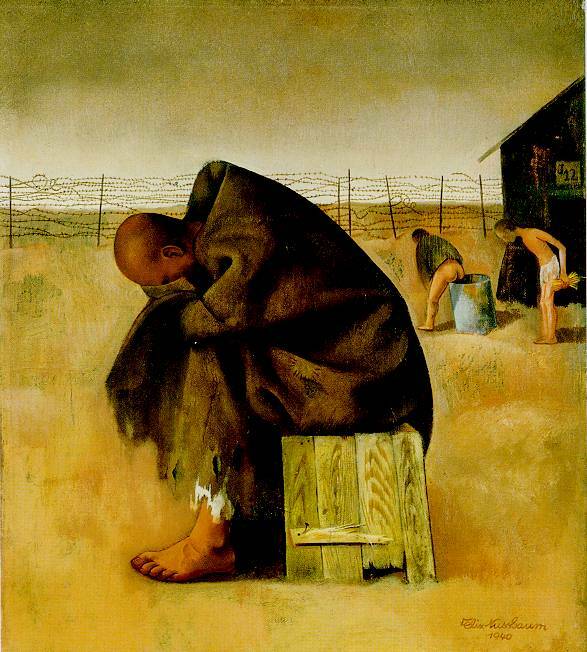 *Image taken from A Holocaust Art Exhibit. You are currently viewing the archives for September, 2011 at The Blog of Disquiet.